The lifting of the ban on electioneering by the Independent National Electoral Commission (INEC) yesterday paved the way for presidential and National Assembly flag bearers of Nigeriaâ€™s political parties to hit the campaign trail. And today, the main opposition party, the Peoples Democratic Partyâ€™s (PDP), presidential candidate, Alhaji Atiku Abubakar, would be launching the first leg of his campaign with the unveiling of his policy document, which he said would guide him in governing Nigeria, if he wins the election next year. The 63-page document, which THISDAY obtained yesterday, listed human capital development, job creation, poverty eradication and infrastructure development as the corner stones of his economic policy, if elected president of Nigeria next year. Titled, â€œLetâ€™s Get Nigeria Working Again,â€ to be officially unveiled today (Monday), the PDP flag bearer said his broad mission is to unite and secure the country by building a strong, resilient and prosperous modern economy that would work for Nigeriansâ€™ needs. Specifically, he said his target would be to create three million jobs annually, just as he disclosed that he would re-launch the National Open Apprenticeship Programme (NOAP) and ensure speedy passage of the National Research and Innovation Fund Bill. He stated,â€œPoverty does not simply have one solution; rather it requires the concerted application of many solutions. Continuing, the PDP presidential candidate said his vision is to deliver an affordable and easily accessible transportation system that would be fully integrated across the length and breadth of Nigeria. According to him, â€œThere would be deliberate efforts to increase access to electricity for Nigerians, including those in rural areas. â€œMy vision is to ensure that Nigeriaâ€™s economy is responsive to the challenges of the 21st century knowledge economy by keeping the amazingly dynamic technological pace. The former vice president stressed that Nigeria could surpass its growth expectations beyond its dreams, adding that he would ensure an increased inflow of foreign direct investment to a maximum of 2.5 per cent of the countryâ€™s Gross Domestic Product (GDP) by 2025. He said he would work towards achieving the lowest corporate income tax rate in Africa; strengthen credit guarantee initiatives of infra-credit, by substantially increasing its capital base and lower transaction costs; amongst others. Atiku said his mission would be to reinforce Nigeriaâ€™s unity by promoting the spirit of co-operation and consensus, especially in a society â€œthat is as complex and as heterogeneous as Nigeria;â€ establishing a strong effective democratic government that secures Nigerians and provides opportunities for them to realise their full potentials, allows greater autonomy for the federating units and gives each region in the country a sense of belonging. He pointed out that despite the countryâ€™s vast resources, Nigeria has failed to deliver the development and living standards expected in the country. â€œNigeriaâ€™s under-performance is attributable largely to the many economic and political structural fault lines that limits its ability to sustain growth, create jobs and achieve real poverty reduction. â€œNigeria needs a unity that is transparently and collectively negotiated and agreed upon. We need to restructure our polity,â€ he added. Atiku pointed out that while economic growth in Nigeria has remained slow and uninspiring, the economy has remained undiversified, uncompetitive and foreign investments has continued to decline. In addition, he stated in the policy document that Nigeria is in a precarious fiscal position, has a fragile financial system, poor exchange rate management system as well as regional disparities. He said his administration would promote agri-business by collaborating with the states; promote the manufacturing sector to achieve increased manufacturing output from nine per cent, to 30 per cent of GDP by 2025. Similarly, he disclosed plan to support micro, small and medium scale enterprises (MSMEs), saying Nigeria has a vibrant informal sector with nearly 40 million MSMEs employing 60 million people or 84 per cent of the labour force; promote the oil and gas sector by among other things, expanding the oil and gas reserves and boost upstream and downstream production. Atiku said if elected, he would build a knowledge-based economy and establish a technology support programme to be funded by a Diaspora bond. The PDP presidential candidate said his administration, if elected, would increase Nigeriaâ€™s export base and the countryâ€™s market in Africa; sign-off the African Free Trade Continental Agreement (AfCFTA), which the Buhari government has failed to sign; engage the organised private sector to identify how best to harness the benefits of the Africa Growth Opportunities Act (AGOA); promote public-private partnerships, among others. â€œOur youths are our most valuable resourcesâ€¦and charting new frontiers. Their entrepreneurial spirit, work ethic and creative abilities are things of pride and should be applauded, encouraged and nurturedâ€¦I should know, I have thousands of them working for me all over the country,â€ he said. Atiku said he truly believes that an educated population forms the backbone for a progressive and prosperous societyâ€¦education is the key to unlocking opportunity, prosperity and progressâ€¦education can and should be this key,â€ he added. In terms of his plan for the health sector, Atiku among others, said he would ensure a comprehensive reform of the Federal Ministry of Health and its agencies as well as accelerate Nigeriaâ€™s transition towards achieving universal access to affordable and quality healthcare services for all by 2030. Furthermore, the former vice president said he would encourage states and the private sector to incentivise studies for girls in sciences, technology, engineering and mathematics (STEM) as well as improve sporting facilities in all states of the country. 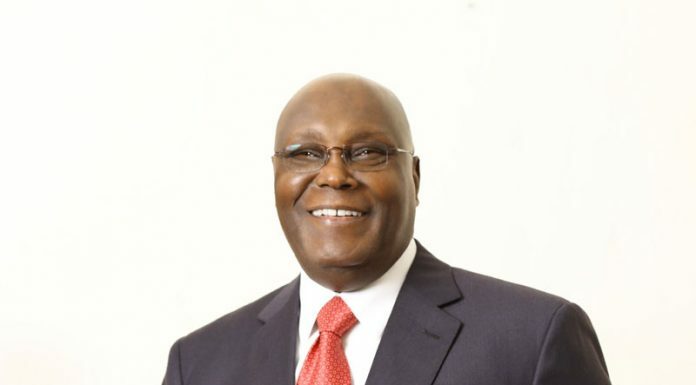 In the area of anti-corruption and rule of law, Atiku said he would champion institutional reforms of anti-corruption agencies and strengthen them to be more effective, retool Nigeriaâ€™s foreign policy instruments as well as reactivate meaningful registration at birth as a way of reducing crime and protect Nigerians. He spoke about security, â€œOur national security is multi-dimensional. It has gone beyond armed defence to include protection of democratic and constitutional values like food security, peace, human, political and economic security. Atiku also said if elected, he would enthrone transparency and accountability at the Nigerian National Petroleum Corporation (NNPC) as well as effect partial privatisation of the corporation. He also said he would incentivise the building of modular refineries in the northern parts of the country, reconsider the introduction of marginal fields bid round and blocksâ€™ bid round; promote gas-power sector linkages as well as create a transparent incentive regime for purposeful growth of the national reserve base for oil and gas. All these are expected to help Nigeria achieve GDP value of $900 billion by 2025. He said he plans to use Public Private Partnership (PPP) to deliver infrastructure in critical sector of the economy. To achieve this, he said he would, â€œAccelerate investment to double our infrastructure stock to approximately 50 per cent of GDP by 2025 and 70 per cent by 2030. The document revealed further that by 2025, Atiku would increase the inflow of direct foreign investment to a minimum of 2.5 per cent of the countryâ€™s GDP, while also working towards achieving the lowest income tax rate in Africa. As he prepared for the launch of his policy document today, he took time last night to pick holes in his main opponentâ€™s policy options saying Buhariâ€™s â€˜next levelâ€™ promises are nothing more than next level propaganda, stressing that the time for propaganda has gone and Nigerians are now interested in proper agenda. In a statement by his campaign organisation, he said, â€œReading through the presentation, we note that it is very vague on policy and very big on promises. Promises are cheap. He added, â€œIn fact, the feedback we have received from Nigerians is one of alarm. Over the last three and a half years of the Buhari administration, Nigeria was officially named as the world headquarters for extreme poverty. Nigerians are asking if this administration is planning â€˜next levelâ€™ poverty for them? The former vice president said in 2018, Transparency International announced that Nigeria made her worst ever retrogression in the Corruption Perception Index moving 12 steps backwards from 136 under PDP to 144 under Buhari. â€œNigerians are asking if this administration is planning â€˜next levelâ€™ corruption for them? If the state of the average Nigerian has not improved in the last three and a half years, more of the same is obviously not what they need,â€ the statement explained. Atiku has also described Buhariâ€™s â€˜next levelâ€™ campaign launched yesterday as nothing more than next level propaganda without concrete policy, stressing that the time for propaganda has gone and Nigerians are now interested in proper agenda.